Several senior US military officials continue to say, for now, they see no evidence Kim is planning any satellite or missile launch, or nuclear test, all of which would be seen by the US as a major provocation. His priorities still appear to be getting sanctions relief from the US and trying to forge more economic links with South Korea -- essentially splitting South Korean President Moon Jae-in from the US position on denuclearization. Durante a cúpula de Hanói com Kim Jong Un, o presidente Donald Trump entregou ao líder norte-coreano um pedaço de papel com exaustiva lista exigências, incluindo a transferência de armas e combustível nuclear para os EUA, de acordo com a Reuters. A lista, que teria sido escrita em inglês e coreano, representou a primeira ação de Trump definindo explicitamente o que significa para ele a desnuclearização pretendida. O almoço entre Trump e Jong Un foi cancelado naquele mesmo dia. O documento provavelmente teria sido visto pelo presidente Norte Coreano como insulto e provocação. A lunch between the two leaders was canceled the same day (28/2). While neither side has presented a complete account of why the summit collapsed, the document may help explain it. A administração Trump, por sua vez, não está disposta a uma abordagem gradual nas negociações com a Coréia do Norte, pelo contrário. “Nobody in the administration advocates a step-by-step approach. 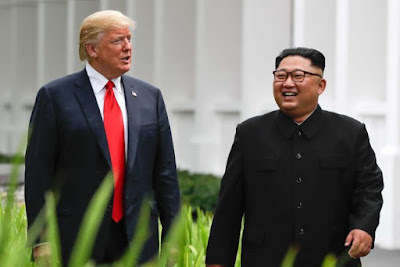 In all cases the expectation is the complete denuclearisation of North Korea as a condition for all the other steps being taken,” the official said, confirming that Trump had also called on Kim to get rid of all North Korea’s chemical and biological weapons at the same time.